CD4+ Th1 and Th17 cells both can cause autoimmune diseases, either alone or collaboratively, if left unchecked. However, what determines the dominant Th effector phenotype in a specific autoimmune disease remains poorly understood. Our present investigation shows that null mutation of IEX-1 promotes differentiation of Th17 cells but compromises the survival of Th1 cells. The differential effect gave rise to a greater number of Th17 cells, a higher level of IL-17 production, and more severe arthritis in IEX-1 knockout mice than in wild-type mice after immunizations with collagen. IEX-1 deficiency-facilitated Th17 cell differentiation was mediated by the increased formation of reactive oxygen species (ROS) at mitochondria following T cell activation, as suggested by marked inhibition of Th17 induction with ROS scavenger N-acetylcysteine or mitoquinone, a specific inhibitor for mitochondrial ROS production. Mitochondrial ROS augmented the expression of B cell-activating transcription factor, which may contribute to increased IL-17 production in the absence of IEX-1, in light of its importance in IL-17 transcription. The results demonstrate that mitochondrial ROS contribute significantly to the dominant Th effector phenotype in autoimmunity in addition to the cytokine milieu. Our view of autoimmune diseases has changed dramatically in the past decade because of the discovery of the importance of Th17 cells (1). In the traditional model, we believe that Th1 cells are the primary Th effector in tissue-specific autoimmune diseases, such as collagen-induced arthritis (CIA), experimental autoimmune encephalomyelitis (EAE), experimental autoimmune uveitis (EAU), and experimental autoimmune myocarditis (2). However, mice genetically deficient in IL-17 are resistant to EAE and CIA (3), transfer of IL-17–producing T cells induces severe EAE (4), and treatment of mice with neutralizing Abs against IL-17 reduces the severity of CIA or EAE (4–6), but these mice are protected from EAU (7). In fact, Th17 and Th1 cells both can cause autoimmune diseases independently or collaboratively (8). These two types of Th cells can colocalize within the region of inflammation or coordinately enter the region in a specific order (9). Strikingly, although IFN-γ–deficient mice are defective in Th1 cell development, the mice develop an elevated Th17 response that exacerbates EAU (7). On the contrary, IL-17 deficiency results in increased differentiation of Th1 cells that causes the pathologic lesion in EAE and EAU (7). That lack of one subset may promote a response driven by the other makes the treatment of these disorders extremely difficult, because targeting one may exaggerate the other, leaving disease progression unchecked or even worsened. Thus, a thorough understanding of what determines the dominant Th effector in a given autoimmune disease may help to develop specific strategies for treatment of the disorder. IEX-1 can be rapidly induced by various physiological and environmental factors, such as irradiation, viral infection, inflammatory cytokines, chemical carcinogens, growth factors, and hormones (10). One of the primary functions of IEX-1 is to target mitochondrial FoF1-ATPase inhibitor for degradation, leading to acceleration of ATP hydrolysis in a cell under stress (11). ATP hydrolysis stimulates ATP synthesis and continuous proton flux through the electron transport chain, thus preventing accumulation of electrons and reactive oxygen species (ROS) production at mitochondria. Transgenic mice that targeted expression of IEX-1 to lymphocytes developed a lupus-like autoimmune disease and T cell lymphoma due to insufficient apoptosis of Th1 cells (12, 13). Paradoxically, the lack of IEX-1 also exaggerated, rather than suppressed, inflammation following Leishmania infection, in part as the result of an elevated level of IL-17 production (14). The reciprocal effects of IEX-1 on Th17 and Th1 differentiation and survival were also observed in dextran sodium sulfate (DSS)-induced colitis; IEX-1 deficiency protected mice from DSS-induced colitis by promoting the survival and differentiation of IL-17–producing T cells while enhancing apoptosis in Th1 cells (15). Overexpression of IEX-1 was shown to suppress mitochondrial ROS (mtROS) production and protect cells from apoptosis, whereas null mutation of IEX-1 increased ROS production at mitochondria, rendering cells susceptible to apoptosis (11). Although the mechanism underlying IEX-1–mediated protection against apoptosis is well studied, it is unknown how IEX-1 deficiency promotes Th17 differentiation. The present study shows that lack of IEX-1 augments the expression of B cell-activating transcription factor (Batf) by increasing mtROS formation. Increased Batf expression may be one of the mechanisms by which IL-17 expression is augmented in the absence of IEX-1, in light of its importance in the regulation of IL-17 transcription previously demonstrated in Batf-deficient T cells (16). This observation, in line with our previous investigations, argues strongly for a crucial role of IEX-1 in the regulation of a balance between Th1- and Th17-driven autoimmune responses by the control of mtROS generation (14, 15). IEX-1 knockout (KO) and wild-type (WT) control mice on a mixed 129Sv/C57BL/6 background (F1) were generated by gene-targeted deletion, as described (17). The animals were housed in conventional cages in the animal facilities of Massachusetts General Hospital in compliance with institutional guidelines, and both female and male mice were used. All of the studies were reviewed and approved by the Massachusetts General Hospital Subcommittee of Research Animal Studies. Chicken type II collagen (CII; Sigma) was dissolved in 10 mM acetic acid at a concentration of 2 mg/ml and emulsified in an equal volume of CFA containing 10 mg/ml heat-killed Mycobacterium tuberculosis (H37Ra; Difco Laboratories, Detroit, MI). To induce CIA, at 5–6 wk of age, IEX-1 KO and WT control mice, with equal numbers of females and males in each group, were intradermally administered 100 μl freshly prepared emulsion at the tail base. 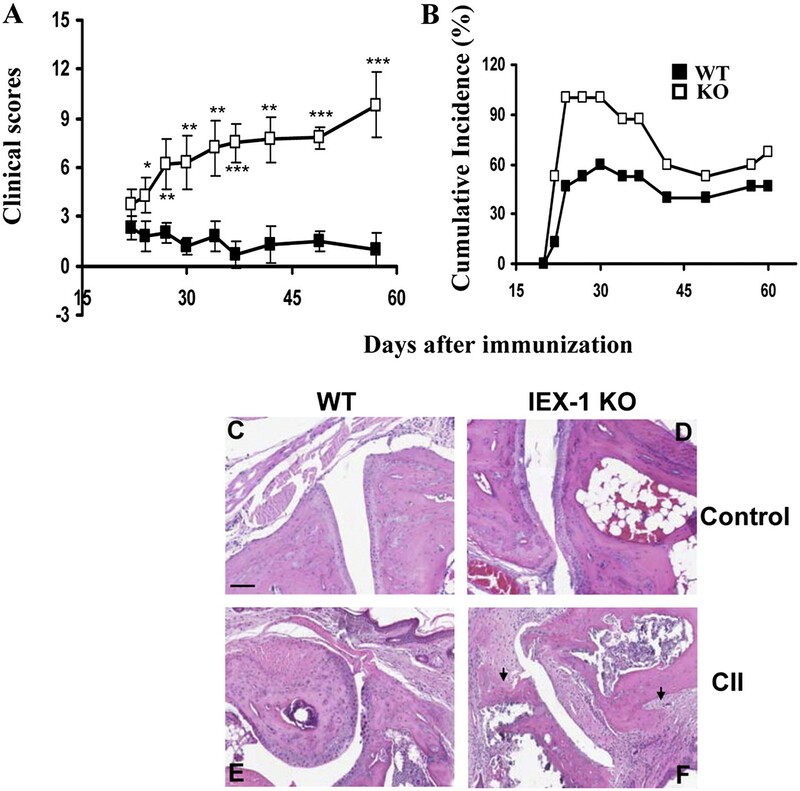 The injection was repeated 21 d later with the amount of M. tuberculosis reduced from 500 to 50 μg/mouse to avoid excessively severe ulceration at the site of immunization in IEX-1 KO mice. The control mice received CFA alone and did not develop arthritis. To determine a role for IL-17 in CIA development in the absence of IEX-1, separate groups of IEX-1 KO mice were immunized similarly as above, along with i.p. injection of anti–IL-17 Ab or control Ab at a dose of 100 μg/mouse once a week, starting from day 0, for 4 consecutive weeks. The neutralizing anti-mouse IL-17A Ab (TC11-18H10.1) and control Ab were obtained from BioLegend (San Diego, CA). The animals were clinically assessed for arthritis at the indicated times: 0, normal; 1, slight swelling; 2, extensive swelling; and 3, joint destruction and/or rigidity. Each paw was graded, giving a maximal score of 12 per mouse, as described (18). One week after the booster immunization, mice were killed, and the hind paws were dissected, snap-frozen in liquid nitrogen, and stored at −80°C until use. The frozen paws were broken into little pieces on dry ice and then homogenized on ice in PBS containing 1 mM PMSF and a protease inhibitor mixture (Amersham, Piscataway, NJ), using a polytron homogenizer (Kinematica, Littau/Lucerne, Switzerland). The resultant tissue homogenates were centrifuged at 15,000 × g for 15 min at 4°C. The supernatants were collected as paw homogenates, and protein and IL-17A levels were measured by a protein assay kit (Bio-Rad) or an ELISA Ready-Set-Go! Kit, per the manufacturer’s protocol (eBioscience, San Diego, CA). The amount of IL-17A was normalized to the protein level for comparison. Single-cell suspensions were prepared from spleens of indicated mice and treated with a mixture of rat anti-mouse Abs against CD19, CD32, and CD8, followed by depletion of Ab-bound cells with BioMag goat anti-rat IgG (Polyscience), per the manufacturer’s instructions. The freshly isolated CD4+ T cells were plated in a six-well plate at 0.6 × 106/well in 2 ml RPMI 1640 medium (Sigma-Aldrich) supplemented with 10% FBS, 2 mM L-glutamine, 50 μM 2-ME, 1× nonessential amino acids, 1 μM sodium pyruvate, and 1% penicillin-streptomycin and stimulated with 1 μg/ml anti-CD3, 2 μg/ml anti-CD28 (BioLegend), 1 ng/ml TGF-β, and 100 ng/ml IL-6 (PeproTech) for Th17 polarization, unless otherwise indicated. After 4 d of incubation, the cells were restimulated with 50 ng/ml PMA (Sigma) and 750 ng/ml ionomycin (Sigma) for 5 h in the presence of 1 μl/ml GolgiPlug (BD Biosciences), followed by intracellular staining and FACS analysis, as described (15). For intracellular staining of IL-17 and IFN-γ, the cells were fixed with 2% formaldehyde, washed with a permeabilization/blocking buffer (BioLegend), and incubated with Alexa Fluor 700-conjugated anti–IL-17 and FITC-conjugated anti–IFN-γ Abs (BioLegend). Similarly, intracellular staining of Foxp3 and p-STAT3 was performed by permeabilization of the cells with a Foxp3 Fix/Perm Buffer (BioLegend) and staining with Alexa Fluor 488-conjugated anti-Foxp3 (BioLegend) or Alexa Fluor 488-conjugated anti–p-STAT3 (Tyr705) (Cell Signaling). The stained cells were evaluated on a FACSAria (BD), and the data were analyzed using FlowJo software (Tree Star, Ashland, OR). Mice were sacrificed by cervical dislocation 30 d after the first immunization, and the paws were removed and fixed in 10% formalin for 4 d. After decalcification in 5% formic acid, the specimens were processed for paraffin embedding, sectioned, and stained with H&E. To analyze RORγt, RORα, and IL-17 gene expression, WT and IEX-1 KO CD4+ T cells were polarized under Th17-polarizing conditions for 24 or 48 h. Total RNA was extracted, reverse-transcribed, and amplified by real-time RT-PCR using a SYBR Green PCR kit (Applied Biosystems, Foster City, CA) on an Mx4000TM Multiplex Quantitative PCR System (Stratagene). Threshold cycle (Ct) was used to calculate the relative template quantity, per the manufacturer’s recommendation, using β-actin as an internal control. The primers used were forward, 5′-CCGCTGAGAGGGCTTCAC-3′ and reverse, 5′-TGCAGGAGTAGGCCACATTACA-3′ for RORγt; forward, 5′-TCTCCCTGCGCTCTCCGCAC-3′ and reverse, 5′-TCCACAGATCTTGCATGGA-3′ for RORα; forward 5′-CTGGAGGATAACACTGTGAGAGT-3′, and reverse, 5′-TGCTGAATGGCGACGGAGTTC-3′ for IL-17; forward, 5′-CCAGAAGAGCCGACAGAGAC-3′ and reverse, 5′-GAGCTGCGTTCTGTTTCTCC-3′ for Batf; forward, 5′-CGCTCAACCTGGCTTACTTC-3′ and reverse, 5′-GGGCTCAACTTGAGGGCG-3′ for IκBζ; and forward, 5′-GGCTGTATTCCCCTCCATCG-3′ and reverse, 5′-CCAGTTGGTAACAATGCCATGT-3′ for β-actin. Expression vectors encoding RORγt were cotransfected into HEK293 cells along with a luciferase reporter vector containing Il17 minimal promoter (19) (all of the vectors were kindly provided by Dr. Chen Dong, Department of Immunology, MD Anderson Cancer Center, Houston, TX). The minimal promoter consisted of DNA sequence −1131 to +1 relative to the translation start site in which the conserved noncoding sequence 2 (CNS2) site contained two ROR receptor-binding elements that could be bound by RORγt or RORα (19). The firefly luciferase activities were assayed and normalized relative to the Renilla luciferase activity in each sample, per the manufacturer’s instruction (Promega). The statistical analysis was based on the calculation of arithmetic mean and SD. The difference between two means was compared by the two-tailed unpaired Student t test assuming equal variances. One-way ANOVA was used for multiple group comparisons. A p value < 0.05 was considered statistically significant. We showed that lack of IEX-1 resulted in expansion of the Th17 population and a high level of IL-17 production in DSS-induced colitis and Leishmania infection (14, 15). To address which signaling was affected by IEX-1 null mutation, leading to a Th17-biased immune response in the mice, CD4+ T cells from WT and IEX-1 KO mice were stimulated under Th17-polarizing conditions with varying concentrations of either TGF-β or IL-6. As can be seen from Fig. 1A, percentages of Th17 cells were increased from ∼5% in the presence of IEX-1 to 12% in the absence of IEX-1 at 1 ng/ml TGF-β and 20 ng/ml IL-6 (p < 0.01), concomitant with an inverse reduction in the proportion of Th1 cells from 3 to 0.3%. There was no significant difference in Th17 and Th1 differentiation when the cells were cultured under nonpolarizing conditions (Th0). The data confirm that enhanced Th17 cell differentiation is an intrinsic characteristic of IEX-1–deficient T cells. Increasing concentrations of TGF-β from 0.2 to 2.5 ng/ml similarly promoted the expansion of Th17 cells in the presence versus absence of IEX-1 (Fig. 1B). However, under similar conditions, increasing amounts of IL-6 widened the difference in Th17 cell differentiation in the presence compared with the absence of IEX-1 in a dose-dependent fashion (Fig. 1C). The maximum effect was observed at a concentration of 100 ng/ml of IL-6, which brought about a 3-fold increase in the percentage of Th17 cells in IEX-1 KO T cells compared with their WT counterparts (8% in WT versus 24% in KO, Fig. 1C). IEX-1 deficiency appeared to affect IL-6–mediated signaling more than TGF-β signaling. Null mutation of IEX-1 enhances Th17 differentiation. (A) WT and IEX-1 KO CD4+ T cells were incubated with 1 μg/ml anti-CD3 and 2 μg/ml anti-CD28 for 4 d (Th0) or together with 1 ng/ml TGF-β and 20 ng/ml IL-6 (Th17), followed by intracellular staining and FACS analysis for IFN-γ versus IL-17 expression. The CD4+ T cells were also differentiated under Th17-polarizing conditions as in (A), with an increasing concentration of TGF-β (B) or IL-6 (C). (D) The CD4+ T cells were differentiated under Th17 conditions in the presence or absence of 50 ng/ml IL-23, 10 μg/ml anti–IL-2 Ab, or vehicle control (C), as in (A). Representative flow cytometric profiles (left panels) and mean percentages ± SD of Th17 cells (right panels) are shown. *p < 0.05, **p < 0.01, ***p < 0.001, in the presence or absence of IEX-1 (n = 6 for all). It has been shown that IL-2 acts as a negative regulator for Th17 differentiation, whereas IL-23 has a supporting effect (4, 20). Thus, the concentrations of these two cytokines were measured in the media collected from Th17 cell culture on days 1 or 2 to corroborate whether the lack of IEX-1 affected Th17 cell differentiation via these two cytokines. We found no significant difference in the production of these two cytokines in the presence or absence of IEX-1 (data not shown). In accordance with this, when anti–IL-2 Ab or IL-23 was added to the culture along with 100 ng/ml IL-6 and 1 ng/ml TGF-β, IL-23 did not have any impact on Th17 cell differentiation, irrespective of IEX-1 expression (Fig. 1D), supporting a dispensable role for IL-23 in the initial induction of Th17 cells (21, 22). The addition of IL-2–neutralizing Ab to the culture robustly, but similarly, stimulated Th17 polarization in WT and IEX-1 KO cells (Fig. 1D). We also tested whether IFN-γ and IL-4 had any impact on the enhanced Th17 cell differentiation lacking IEX-1; we failed to detect any significance in the presence or absence of anti–IFN-γ and/or anti–IL-4 Ab in this Th17-polarizing condition (data not shown). The observation is similar to previous findings showing no effects of anti–IFN-γ and/or anti–IL-4 Ab on Th17 differentiation when purified CD4+ T cells were polarized in the presence of TGF-β and IL-6 (23). Our previous investigation showed that lack of IEX-1 significantly increased ROS formation in T cells after stimulation with anti-CD3/CD28 (14). Thus, we sought to test whether Th17 cell differentiation was sensitive to ROS by adding a cell permeable ROS scavenger N-acetylcysteine (NAC) to Th17 cell-differentiation cultures. As shown in Fig. 2A, NAC suppressed Th17 cell development in both WT and IEX-1 KO T cells and with or without anti–IL-2 Ab. Unlike NAC, another ROS scavenger, mitoquinone (MitoQ), abrogated Th17 cell differentiation in IEX-1–deficient T cells only, with little inhibitory effect on WT Th17 cell differentiation, regardless of whether anti–IL-2 Ab was added to the culture (Fig. 2B). MitoQ, a coenzyme Q10 analog, is a specific inhibitor for mtROS formation because it contains a lipophilic triphenylphosphonium cation that causes the antioxidant to accumulate at levels several hundred-fold higher within mitochondria than outside the mitochondria because of the high mitochondrial membrane potential (24, 25). MitoQ was shown to diminish ROS formation at mitochondria to WT levels in IEX-1–deficient aortic rings (17). We also tested apocynin for its effect on Th17 differentiation in the absence of IEX-1. Apocynin blocks an association of p47phox and p67phox with the gp91phox subunit within the membrane NAD(P)H oxidase complex and acts as a specific inhibitor of ROS formation by the membrane NAD(P)H oxidase. Inclusion of the compound in the culture did not alter Th17 polarization in either WT or IEX-1 KO T cells at the concentration range of 10–250 μM (data not shown). The data are in agreement with our previous investigation suggesting that mitochondria, not NADPH oxidases, are the source of ROS formation in the absence of IEX-1 (17). Effects of antioxidants on Th17 differentiation. WT and IEX-1 KO CD4+ T cells were stimulated with 1 μg/ml anti-CD3, 2 μg/ml anti-CD28, 1 ng/ml TGF-β, and 100 ng/ml IL-6 for 4 d, with or without anti–IL-2 Ab, in the presence or absence of 10 mM of NAC (A) or 200 nM MitoQ (B), followed by intracellular staining and FACS analysis for IFN-γ versus IL-17 expression, as in Fig. 1. Representative flow cytometric profiles (left panels) and mean percentages ± SD of Th17 cells (right panels) are shown. *p < 0.05, **p < 0.01, ***p < 0.001, versus WT cells or untreated IEX-1 KO cells (n = 6). In the Il17 gene promoter, the CNS2 site contains two ROR receptor-binding elements that can be recognized and bound by RORγt, the Th17 lineage-specific transcription factor and is indispensable for Il17 transcription (19, 26). To address whether ROS had any effects on Il17 transcription, a luciferase reporter directed under the Il17–CNS2 minimal promoter was transfected into HEK293 cells. The Il17 minimal promoter alone displayed little luciferase activity (Fig. 3A), which was not affected by inclusion of 1 or 5 mU/ml of glucose oxidase (GO) in the cell culture (data not shown). GO is an enzyme that is used as a continuous generator of H2O2 and it is thus a suitable model for chronic exposure of cells to low levels of H2O2 (27, 28). The Il17 minimal promoter was drastically activated over a control when an expression vector encoding RORγt was cotransfected with the Il17 minimal promoter-luciferase reporter (Fig. 3A). The Il17 transcription was further increased by GO in a dose-dependent manner (Fig. 3B). In contrast, the presence of antioxidant NAC in the culture attenuated the luciferase activity, also in a dose-dependent manner (Fig. 3C). The data suggest that ROS facilitate Th17 differentiation, at least in part, through enhancing RORγt transcriptional activity in the Il17 promoter. 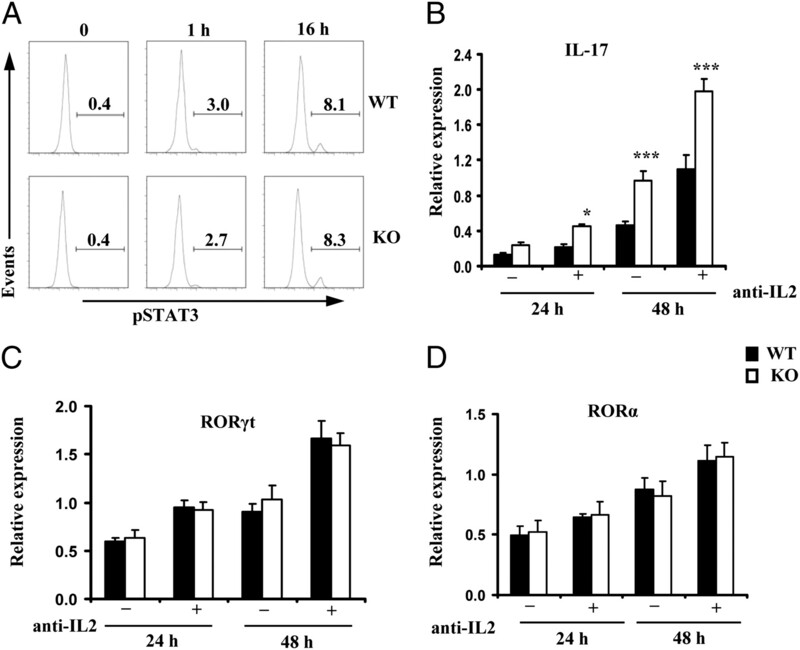 ROS increase IL17 transcription in the presence of RORγt. (A) HEK293 cells were transfected with a RORγt expression vector (RORγt) or empty vector (Vector) along with a minimal CNS2–Il17 promoter-luciferase reporter. The cells transfected with the RORγt plasmid and the minimal CNS2-Il17 promoter-luciferase reporter were treated with 0, 1, or 5 mU/ml of GO (B) or 0, 1, 5, or 10 mM of NAC (C). The resultant cells were lysed at 24 h, and luciferase activities were assayed; Renilla luciferase activity was used for the normalization of transfection efficiency, and background luciferase activities in control cells transfected with empty vector alone were set to 1. The data are expressed as mean fold increases ± SD (A) or mean percentages ± SD (B, C) of luciferase activity values relative to control cells from three separate experiments, each performed in duplicate. **p < 0.01, ***p < 0.001 versus control cells. We went on to determine the signaling pathways augmenting Il17 transcription in the absence of IEX-1. STAT3 is a redox-sensitive transcription factor that is activated in response to IL-6, and it can directly enhance Il17 transcription through binding to the promoter (29). Moreover, ROS were shown to trigger STAT3 tyrosine phosphorylation and nuclear translocation in lymphocytes (30, 31). This, in line with increased sensitivity of IEX-1–deficient T cells to IL-6 (Fig. 1C), prompted us to evaluate STAT3 phosphorylation at varying times after polarization of the CD4+ T cells in Th17 conditions. Intracellular staining for p-STAT3 revealed an increase in the percentages of cells expressing p-STAT3 after activation (Fig. 4A). However, the levels and kinetics of STAT3 phosphorylation were comparable between WT and IEX-1 KO Th cells and with or without anti–IL-2 Ab (Fig. 4A, data not shown). Consistent with an unaltered level of STAT3 expression and phosphorylation in the presence or absence of IEX-1, the mRNA levels of RORγt and RORα, two STAT3-regulated transcription factors that are crucial in directing Th17 differentiation, did not differ significantly in WT and IEX-1 KO CD4+ T cells after 24 or 48 h of culture under Th17-polarizing conditions (Fig. 4C, 4D). Notably, at these two time points, a higher level of IL17 expression was already detected in IEX-1 KO Th cells compared with their WT counterparts (Fig. 4B), ruling out that the enhanced Th17 differentiation in IEX-1 KO CD4+ T cells is associated with increased expression of RORγt or RORα. Enhanced Th17 differentiation in IEX-1 KO T cells is independent of STAT3 phosphorylation or RORγt/RORα expression. (A) Unaltered STAT3 phosphorylation in the presence or absence of IEX-1. WT or IEX-1 KO CD4+ T cells were treated with Th17 inducers for 0, 1, or 16 h and then subjected to intracellular staining for phosphorylated STAT3 (pSTAT3), followed by flow cytometric analysis. The numbers indicate the percentages of pSTAT3+CD4+ T cells relative to total CD4+ T cells. Similar results were obtained from three independent experiments. (B–D) RORγt or RORα expression is not upregulated by null mutation of IEX-1, despite increasing IL-17 production in the cells. WT and IEX-1 KO CD4+ T cells were polarized under Th17 conditions, with or without anti-IL-2 Ab, for 24 or 48 h. Total RNA was extracted from the resultant cells. The expression level of IL-17 (B), RORγt (C), and RORα (D) was measured by quantitative RT-PCR and normalized to the expression level of β-actin. The data are mean ± SD of three independent experiments, each performed in duplicate. *p < 0.05, ***p < 0.001, in the presence or absence of IEX-1. The observation of similar levels of RORγt and RORα expression in the presence or absence of IEX-1, despite a significantly higher level of IL-17 production in IEX-1–deficient Th17 cells, suggested that other transcription factor(s) were involved in the increased transcription activity of the Il17 promoter. Transcription factors, such as Batf, Runx1, Irf4, and IκBζ, can directly enhance the transcription activity of IL-17 in the presence of RORγt (32). Among them, Batf and IκBζ are a member of the activator protein-1 (AP-1) and NF-κB family, respectively, and both are sensitive to redox-mediated regulation (33). We found that Batf was upregulated significantly in Th17 cells compared with Th0 cells (Fig. 5A), confirming a previous investigation (16). The expression was correlated with IL-17 production in the cells, with a significantly higher level in IEX-1 KO Th17 cells than in WT Th17 cells at each time point tested (Fig. 5A). The finding is in a good agreement with synergistic effects of Batf with RORγt on induction of IL-17 production previously demonstrated (16, 34). There was no significant difference in Batf expression in the presence or absence of IEX-1 when the cells were differentiated under Th0-polarizing conditions. Batf expression in IEX-1–deficient Th17 cells was decreased to WT levels in the presence of antioxidant NAC or MitoQ in the culture (Fig. 5B), corroborating the regulation of Batf expression by redox-sensitive signaling in the absence of IEX-1. Unlike Batf, IκBζ was increased in Th0 cells in the absence, compared with the presence of IEX-1, and no significant difference was found in Th17 cells, regardless of IEX-1 expression (data not shown). Batf expression is increased in the absence of IEX-1 in a ROS-dependent fashion. (A) WT and IEX-1 KO CD4+ T cells were polarized for 24 or 48 h in Th0 conditions (as in Fig. 1) or in Th17 conditions (as in Fig. 2). (B) The cells were differentiated under Th17-polarizing conditions in the presence or absence of either 5 mM NAC or 200 nM MitoQ for 24 h. Total RNA was extracted from the differentiated cells, and Batf expression was measured by quantitative RT-PCR and normalized to the expression level of β-actin. Data are the mean ± SD of three independent experiments, each performed in duplicate. ***p < 0.001, in the presence or absence of IEX-1, between Th0 and Th17 cells (A) or in the presence or absence of the indicated oxidants (B). Our previous study showed more Th17 cells in Leishmania infection and in DSS-induced colitis in the absence of IEX-1 (14, 15). However, these animal models are not typical models for validating a role for Th17 cells in autoimmune diseases. In contrast, CIA is one of several organ-specific autoimmune disease models initially used to demonstrate the importance of Th17 cells in autoimmunity (35). Thus, CIA susceptibility was assessed in IEX-1 KO mice per a published protocol (18). IEX-1 null mutation exaggerated collagen-induced autoimmunity in the paw (Fig. 6A, 6B), which was manifested by significantly greater clinical scores and cumulative incidence of arthritis in the absence of IEX-1 compared with its presence (p < 0.01). No arthritis was found in control mice receiving CFA alone, as previously described (data not shown) (18). The clinical scores correlated with histological analysis; the lack of IEX-1 caused widespread infiltration of inflammatory cells throughout the joint tissue, synovial hyperplasia, and cartilage and bone erosion (Fig. 6F). Pannus (arrow) was frequently seen invading from the marginal zone into the cartilage or the medulla of the subchondral bone (Fig. 6F). In contrast, WT mice exhibited a low level of inflammation, mainly in the bone marrow and cartilage (Fig. 6E), compared with nonarthritic control mice (Fig. 6C, 6D). Despite the increased severity of arthritis in the absence of IEX-1, total anti-CII IgG or anti-CII IgG isotypes were not significantly different in the presence or absence of IEX-1 (data not shown); this was not unexpected, because similar levels of anti-CII Ab production were previously described in CII-immunized mice, regardless of arthritis development (18) or IL-17 levels (36). The result stresses that lack of IEX-1 may preferentially affect cellular or innate immune responses over humoral immune responses. In accordance with a role for IL-17 in the aggravation of CIA in IEX-1 KO mice, the proportions of Th17 cells in the draining lymph nodes were significantly elevated in IEX-1 KO mice, concurrent with a diminished level of Th1 cells, compared with WT mice (Fig. 7B, 7D). There was no difference in the level of T regulatory cell (Treg) populations in the draining lymph nodes between WT and IEX-1 KO mice (Fig. 7C, 7D). IL-17 production was also significantly higher in inflamed paws in the absence, relative to the presence of IEX-1 (Fig. 7A). Furthermore, treatment of IEX-1 KO mice with anti–IL-17 Ab for 4 consecutive weeks during CIA development significantly suppressed the clinical score (Fig. 7E), the cumulative incidence of CIA (Fig. 7F), and histopathology (Fig. 7G) in IEX-1 KO mice compared with the mice treated with a control Ab (Fig. 7E, 7F, 7H). 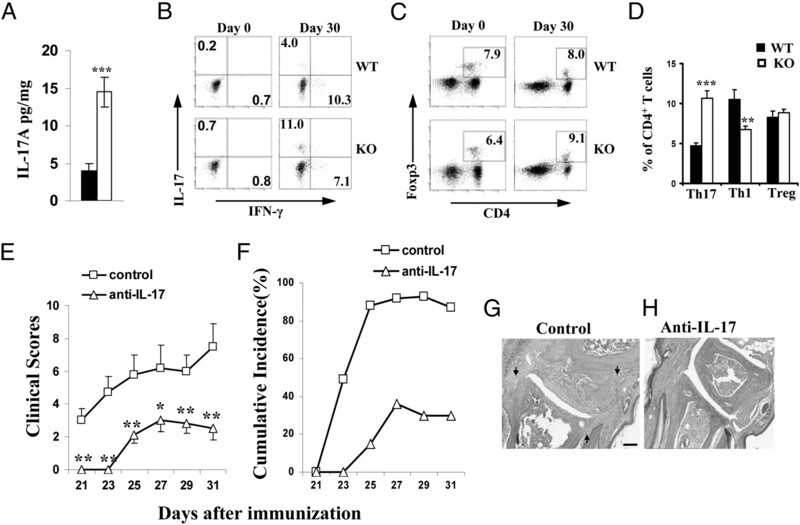 These results argue strongly for the importance of IL-17 in the pathogenesis of CIA in the absence of IEX-1, but other cell types or factors may also be involved, because anti–IL-17 Ab did not completely abolish the disease in the mice. Lack of IEX-1 aggravates CIA. CIA was induced in WT and IEX-1 KO mice, and the clinical scores (A) and cumulative incidence of arthritic mice (B) were assessed in the mice every other day after the booster immunization. Representative macroscopic images of H&E-stained joint sections prepared from WT (C, E) and IEX-1 KO (D, F) mice immunized with adjuvant only (C, D) or with a mixture of CII and adjuvant (E, F). Arrows indicate pannus. Scale bar, 100 μm. *p < 0.05, **p < 0.01, ***p < 0.001, in the presence or absence of IEX-1 (n = 12). 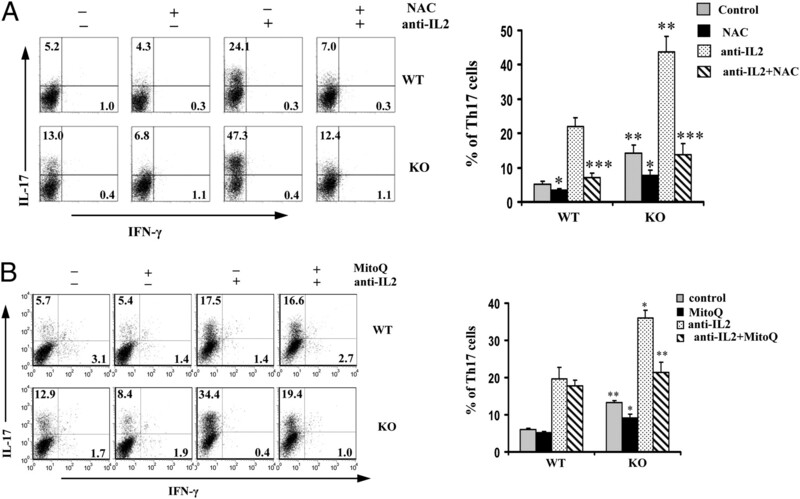 Th17-biased immune responses in IEX-1–deficient mice. (A) Diseased mice were killed on day 30 after primary immunization, the hind paws were dissected and homogenized, and IL-17A levels in the homogenate were determined by ELISA. Draining lymph nodes were isolated from WT and IEX-1 KO mice on day 0 or 30 after primary immunization. The percentages of Th17, Th1, and Tregs were analyzed by intracellular staining for IL-17 and IFN-γ (B) or Foxp3 (C). Representative flow cytometric profiles are shown in (B) and (C), and mean percentages ± SD of Th17, Th1, and Tregs on day 30 are summarized in (D). (E–H) IEX-1 KO mice were immunized with CII in CFA as in Fig. 6, and anti–IL-17 Ab or control Ab (control) was administered i.p. for 4 consecutive weeks starting on day 0. The clinical scores (E) and cumulative incidence of arthritis (F) were assessed in the mice every other day for 10 d after the booster immunization. Representative microscopic images of H&E-stained joint sections were prepared from IEX-1 KO mice treated with control Ab (G) or anti-IL-17 Ab (H). Arrows denote pannus. Scale bar, 100 μm. *p < 0.05, **p < 0.01, ***p < 0.001, in the presence or absence of IEX-1 (n = 6). Differentiation of Th17 cells is primarily directed by a lineage-specific transcription factor RORγt (19, 37). The current study shows for the first time, to the best of our knowledge, that the transcriptional activity of the IL-17 promoter can be potentially regulated by a redox-sensitive mechanism through upregulation of Batf. This finding is in a good agreement with the ability of resveratrol, a plant-derived compound, to suppress CIA, in part by inhibition of Th17 cell differentiation (38). It may not be a coincidence that resveratrol suppresses Th17 differentiation by upregulation of super oxide dismutase at mitochondria that modulates mitochondrial oxidative stress (39). These observations stress a role for mtROS in tuning a delicate balance of Th1/1h17 immune responses. Our data showed that although IL-6 promoted Th17 polarization in both WT and IEX-1 KO Th cells in a dose-dependent manner, it had a significantly greater impact in the absence of IEX-1. IL-6 stimulated transcription of RORγt/RORα via phosphorylation of STAT3, but we failed to find any significant difference in STAT3 phosphorylation or RORγt/RORα expression in Th17 cells in the presence or absence of IEX-1, despite the importance of ROS in the regulation of STAT3 phosphorylation and transactivation (30, 40). Won et al. (41) showed that glutathione peroxidase 1-deficient Th cells produced higher levels of intracellular ROS and IL-2 than did WT Th cells, which suppressed Th17 cell development. This was apparently not the case for IEX-1 KO T cells; IL-2 production was not altered significantly in the absence compared with the presence of IEX-1, probably because the effect of ROS varies with the level and location of ROS production and the cell type or tissues involved. In addition to RORγt and RORα, transcription factors, such as Batf, Runx1, Irf4, and IκBζ, can directly enhance the transcription activity of IL-17 in the presence of RORγt (32). Among them, Batf, but not IκBζ, was upregulated at a level significantly higher in IEX-1 KO T cells than in WT T cells when differentiated under Th17-polarizing conditions. A previous investigation showed normal TGF-β signaling and STAT3 phosphorylation in Batf-deficient T cells but altered expression of a subset of IL-6–induced genes and compromised RORγt expression under Th17-differentiation conditions (16). As a result, the mice have a defect in Th17 cell differentiation and are resistant to EAE (16). However, retroviral RORγt expression of Batf−/− cells only partially restored IL-17 expression in the cells, suggesting that Batf-regulated RORγt expression is not the only mechanism for its regulation of IL-17 transcription. Indeed, in addition to regulation of RORγt expression, Batf directly bound the regulatory regions that overlapped with the RORγt binding site in the IL-17 promoter, where it interacted with RORγt and synergized the induction of IL-17 expression (16, 34), which may also be the mechanism underlying a high level of IL-17 expression in the absence of IEX-1. Batf is a member of the basic leucine zipper proteins of the AP-1 family, and it is sensitive to a redox status of the cells (Fig. 5B). mtROS induced by IEX-1 deficiency enhance the transcription activity of IL-17, at least in part by upregulation of Batf in light of its important transcription activity on the IL-17 promoter, although we cannot rule out that other mechanisms may be involved, such as acetylation of the IL-17 promoter or nuclear translocation of RORγt or RORα transcription factor (26). The second important finding of this investigation was a role for mitochondria in Th differentiation under a pathological condition. Considerable evidence demonstrated the participation of cell membrane-associated NADPH oxidases in the regulation of inflammation. Lack of a functional NADPH oxidase reduced the level of ROS production in monocytes, macrophages, dendritic cells, and phagocytes, predisposing to severe CD4+ cell-dependent CIA in mice lacking Ncf-1 or gp47, a subunit of the cell membrane-associated NADPH oxidases (42). In contrast to the well-established role of NADPH oxidase in the regulation of inflammation, our understanding of how mtROS contribute to innate immune responses is just emerging (43). Mitochondrial antiviral and Jun/MAPK-signaling pathways are two major pathways that can be activated or augmented by mtROS, leading to NF-κB activation and inflammatory responses (44, 45). Several redox-sensitive proteins involved in cell signaling have also been identified in mitochondria, including protein kinase C, Akt, A-Raf, and src protein tyrosine kinases, the activation of which could augment the transcriptional activity of AP-1, CREB, or NF-κB (46). How the mtROS-mediated signaling is involved in augmentation of Batf expression in the absence of IEX-1 is under investigation. The present study extends the role of mtROS in the innate immune responses to Th17 differentiation under pathological conditions. The mitochondrial source of ROS generation is evident from the fact that T cells do not express cell membrane-associated NADPH oxidases (47). Moreover, MitoQ, but not apocynin, blunts the propensity of IEX-1 KO T cells to differentiate into Th17 cells. Interestingly, NAC, a broad-spectrum antioxidant, suppresses Th17 differentiation in both WT and IEX-1 KO Th cells, whereas MitoQ specifically abrogates Th17 differentiation in the absence of IEX-1; this suggests that mtROS-mediated signaling is not required for Th17 differentiation under physiological conditions, but it is involved in pathological conditions, making it an attractive target for treatment of Th17-skewed autoimmune diseases. Accumulating evidence suggests that Th differentiation, and in particular, Th17 cell differentiation, can be tuned by a variety of environmental cues. For instance, HIF-1α, a sensor of hypoxia, can upregulate RORγt transcription directly or indirectly through a metabolic switch to glycolysis, facilitating Th-17 differentiation (48, 49). Likewise, the mammalian target of rapamycin complex (mTORC)-1 and mTORC-2 are two well-known metabolic sensors that regulate cellular metabolism in response to environmental cues like acids, insulin, and growth factors (50). mTORC-1 signaling is required for Th1 and Th17 differentiation, whereas mTORC-2 signaling is pivotal for Th2 differentiation (51). Our current and previous investigations show that mtROS contribute to a balance of Th1 and Th17 cell differentiation, which may be of particular significance in autoimmune diseases in the elderly, because mitochondrial function degenerates with age. IEX-1 is highly inducible by a variety of environmental cues, and its induction may be necessary to protect Th1 cells from apoptosis but suppress Th17 cell differentiation (14). In support, overexpression of IEX-1 in T cells predisposed mice to the development of a lupus-like autoimmune disease and T cell lymphoma as the result of insufficient apoptosis of T cells (12, 13). In contrast, lack of IEX-1 reduced the percentage of Th1 cells in inflamed paws. Similarly, lack of IEX-1 increased inflammation cytokine-induced apoptosis in Th1 cells, ameliorating inflammation in DSS-induced acute colitis and a wasting disease triggered by adoptive transfer of CD4+CD45RBhigh cells (15). 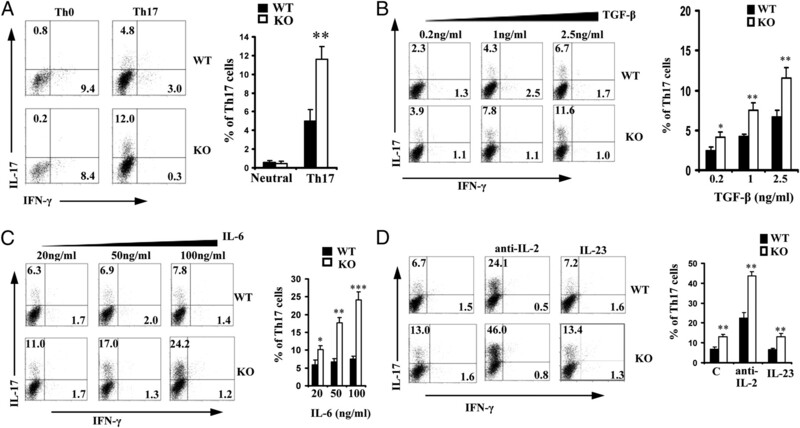 Strikingly, in marked contrast to the increased susceptibility of Th1 cells to apoptosis, lack of IEX-1 promoted the differentiation of IL-17–producing T cells both in vivo and in vitro. The proportions of Th17 cells in the draining lymph nodes and the levels of IL-17 in paw tissues of arthritic IEX-1 KO mice were significantly higher than were those in arthritic WT mice, suggesting a Th17-dominant immune response in the exacerbated arthritis in IEX-1 KO mice. IEX-1–regulated survival of T cells in a T cell subset-specific manner explains how targeting one Th subset may promote development of the other, as well as the failure of many clinical trials using antioxidants for the treatment of various autoimmune diseases, including rheumatoid arthritis, despite an established, inverse association between the overall antioxidant index and the development of rheumatoid arthritis (52). In conclusion, our investigation suggests that mtROS-mediated signaling serves as another layer of the complex regulation of Th17 differentiation, in addition to the cytokine milieu. Although both Th1 and Th17 effector T cells can cause autoimmune-mediated pathology, they are distinct in their recruitment of inflammatory leukocytes to the site of inflammation and in the preferential tissue location of the pathology, thereby affecting the manifestations of clinical disease and its treatment. A better understanding of why Th17 cells are dominant in some autoimmune diseases, whereas Th1 cells are dominant in others or even in the same autoimmune disease, is essential for developing specific treatments of these autoimmune diseases. We thank the members of Dr. Wu’s groups for stimulating discussions and valuable comments. We also thank Dr. Chen Dong (Department of Immunology, MD Anderson Cancer Center) for RORγt expression plasmid and a luciferase reporter vector containing the Il17 minimal promoter with a CNS2 element. We are grateful to Dr. Michael Murphy (Medical Research Council Dunn Human Nutrition Unit, Cambridge, U.K.) for the generous gift of MitoQ. All authors were involved in writing the manuscript and approved the submission. M.X.W. conceived the study and its design; L.Z., I.V.U., X.C., and Q.Z. performed the experiments; and L.Z., I.V.U., and M.X.W. analyzed and interpreted the data. This work was supported in part by National Institutes of Health Grants AI050822 and AI070785 and a Senior Research Award from the Crohn’s and Colitis Foundation of America (to M.X.W.).
. 2007. Differentiation and function of Th17 T cells. Curr. Opin. Immunol. 19: 281–286.
. 1996. Functional diversity of helper T lymphocytes. Nature 383: 787–793.
. 2003. Suppression of immune induction of collagen-induced arthritis in IL-17-deficient mice. J. Immunol. 171: 6173–6177.
. 2004. Treatment with a neutralizing anti-murine interleukin-17 antibody after the onset of collagen-induced arthritis reduces joint inflammation, cartilage destruction, and bone erosion. Arthritis Rheum. 50: 650–659.
. 2008. Either a Th17 or a Th1 effector response can drive autoimmunity: conditions of disease induction affect dominant effector category. J. Exp. Med. 205: 799–810.
. 2010. Th1 and Th17 cells: adversaries and collaborators. Ann. N.Y. Acad. Sci. 1183: 211–221. 2003. Roles of the stress-induced gene IEX-1 in regulation of cell death and oncogenesis. Apoptosis 8: 11–18.
. 2009. IEX-1 targets mitochondrial F1Fo-ATPase inhibitor for degradation. Cell Death Differ. 16: 603–612.
. 2002. Impaired apoptosis, extended duration of immune responses, and a lupus-like autoimmune disease in IEX-1-transgenic mice. Proc. Natl. Acad. Sci. USA 99: 878–883.
. 2003. Development of T-cell lymphomas in Emu-IEX-1 mice. Oncogene 22: 6845–6851.
. 2009. Enhanced susceptibility to Leishmania infection in resistant mice in the absence of immediate early response gene X-1. J. Immunol. 183: 7994–8003.
. 2012. Reciprocal regulation of the survival and apoptosis of Th17 and Th1 cells in the colon. Inflamm. Bowel Dis. 18: 333–343.
. 2010. Impaired 3′,5′-cyclic adenosine monophosphate-mediated signaling in immediate early responsive gene X-1-deficient vascular smooth muscle cells. Hypertension 56: 705–712.
. 2000. Collagen-induced arthritis in C57BL/6 (H-2b) mice: new insights into an important disease model of rheumatoid arthritis. Eur. J. Immunol. 30: 1568–1575. 2009. How mitochondria produce reactive oxygen species. Biochem. J. 417: 1–13.
. 2010. Therapeutic use of coenzyme Q10 and coenzyme Q10-related compounds and formulations. Expert Opin. Investig. Drugs 19: 535–554.
. 2007. Chromatin remodeling of interleukin-17 (IL-17)-IL-17F cytokine gene locus during inflammatory helper T cell differentiation. J. Biol. Chem. 282: 5969–5972.
. 1997. Preferential mitochondrial DNA injury caused by glucose oxidase as a steady generator of hydrogen peroxide in human fibroblasts. Mutat. Res. 385: 139–149.
. 1999. Immunotargeting of glucose oxidase: intracellular production of H(2)O(2) and endothelial oxidative stress. Am. J. Physiol. 277: L271–L281.
. 1999. Oxidative stress triggers STAT3 tyrosine phosphorylation and nuclear translocation in human lymphocytes. J. Biol. Chem. 274: 17580–17586. 2010. Transcriptional regulation of T helper 17 cell differentiation. Yonsei Med. J. 51: 484–491.
. 1997. Study of gene regulation by NF-kappa B and AP-1 in response to reactive oxygen intermediates. Methods 11: 301–312.
. 2009. BATF: bringing (in) another Th17-regulating factor. J. Mol. Cell Biol. 1: 66–68.
. 2009. Effector mechanisms of interleukin-17 in collagen-induced arthritis in the absence of interferon-gamma and counteraction by interferon-gamma. Arthritis Res. Ther. 11: R122.
. 2012. Resveratrol modulates murine collagen-induced arthritis by inhibiting Th17 and B-cell function. Ann. Rheum. Dis. 71: 129–135.
. 2009. Resveratrol attenuates mitochondrial oxidative stress in coronary arterial endothelial cells. Am. J. Physiol. Heart Circ. Physiol. 297: H1876–H1881.
. 2001. Mitochondrially associated hepatitis B virus X protein constitutively activates transcription factors STAT-3 and NF-kappa B via oxidative stress. Mol. Cell. Biol. 21: 7721–7730.
. 2010. Glutathione peroxidase 1 deficiency attenuates allergen-induced airway inflammation by suppressing Th2 and Th17 cell development. Antioxid. Redox Signal. 13: 575–587.
. 2008. Th17 development and autoimmune arthritis in the absence of reactive oxygen species. Eur. J. Immunol. 38: 1118–1126.
. 2005. Mitochondrial signals to nucleus regulate estrogen-induced cell growth. Med. Hypotheses 64: 133–141.
. 2006. T cell surface redox levels determine T cell reactivity and arthritis susceptibility. Proc. Natl. Acad. Sci. USA 103: 12831–12836.
. 2011. Control of T(H)17/T(reg) balance by hypoxia-inducible factor 1. Cell 146: 772–784.
. 2011. HIF1alpha-dependent glycolytic pathway orchestrates a metabolic checkpoint for the differentiation of TH17 and Treg cells. J. Exp. Med. 208: 1367–1376.
. 2004. Upstream and downstream of mTOR. Genes Dev. 18: 1926–1945.
. 2011. The kinase mTOR regulates the differentiation of helper T cells through the selective activation of signaling by mTORC1 and mTORC2. Nat. Immunol. 12: 295–303.
. 2004. Oxidation in rheumatoid arthritis. Arthritis Res. Ther. 6: 265–278.